Multifunctional digital controller & datalogger for processing the signal from an extensive range of sensors for the purpose of controlling a process or recording test data. The MultiCon has a modular design with three slots in the rear for adding analogue signal conditioning cards which can handle up to 72 signals at once. A fully configurable touchscreen display allows the operator to choose which parameters to display on the MultiCon controller and data logger and in which graphical format such as chart, bargraph, dials or numeric values. To help with device configuration it is possible to connect a standard USB keyboard and mouse directly to the MultiCon. The MultiCon logging controller can provide up to 8 proportional, integral and derivative (PID) control functions along with up to 12 separate On/Off alarm relays. The internal datalogging memory of the MultiCon process controller can store up to 250 million samples of data with a 1.5GB memory capacity. The DAQ Manager datalogging desktop software package is used to retrieve data and groups it to produce graphs or tables. SCADALite is an innovative feature that allows you to manage the process directly from the MultiCon display. Essential information can be presented in a graphical form enriched with animations, dynamic graphs and the most significant numerical parameters, as well as audible alerts in the case of an alarm. SCADALite allows you to create as many as 15 individual screens, presenting a various range of required information. The SCADALite implementation is straightforward, you can upload a graphical design or a simple photo of the application into the device, and overlay the indicators. This can be accomplished within a few minutes and directly from the MultiCon screen. Logical functions already installed in the MultiCon make it possible to create simple control procedures. In the example opposite, the tanks levels of the fruit juice constituents are monitored and used to switch batch valves. After finishing a whole process sequence, the controller will switch the pump on to refill each tank. The varying levels are shown on the CMC display screen. Some of the MultiCon outputs can be utilised for alarm signals, to use as a simple controller and HMI unit collected in one single device. There is no need to create a visualisation application and control procedures separately. In this kind of industrial application the CMC-99 collects all analog measurements and sends them through one Modbus RTU serial link to the main PLC. The distance between CMC-99 and a PLC installation can be up to 1000 m.
All measurements are sent using one cable instead of multiple analog signal wire connections, which is a very cost effective method. Modbus RTU is a very popular and reliable communication protocol. There is also the possibility to divide a Modbus network into several subnets, and the CMC-99 can work as a Master in one subnet and as a Slave in another. MultiCon collects all analog measurements using Modbus RTU protocol as a Master mode. All data are sent to another device (e.g. PLC) using one single cable. Today it is the most advisable communication method when using the MultiCon with distributed application structures. Modbus RTU protocol can be used in explosive Atex zone as well. There is no need to extend system. All analog measurements are collected together and shown on the CMC screen. This controller can be extended by up to three Modbus RTU subnets. For example a subnet can be created to connect a CMC with a PLC, and the PLC acts as the Master and the MultiCon as the Slave. Nowadays industrial automation trends are going towards miniaturization and universalization. Outdated and unreliable systems like synoptic control boards can be now replaced with multi-purpose single devices. Today meters/controllers should be able to meet many customers specific needs.MultiCon is an ideal solution for applications where simultaneous measurement and regulation of numerous channels are required. All control functions are collected in one single device. CMC is equipped with colour TFT touchscreen that makes it possible to create simple HMI applications, which saves a lot of time. There are plenty of different screen types which allow the user to visualize different measurements in a clear way. Even a complicated automation process can be easily displayed on the MultiCon screen. Different types of inputs are joined with virtual channels, which can then be used with the built-in control methods to make the MultiCon controller cover almost every industrial automation process. The MultiCon controller allows you to create custom measurement channels using arithmetic functions. 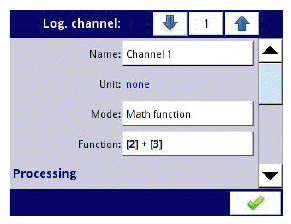 The user can adapt any measurement channel using using arithmetic operations. In this example the arithmetic function is very useful when MultiCon is used as a signal analyser for monitoring power, power factors and electric energy. In this application you only need to measure voltage and current via the input channels, and all the previously mentioned values can be calculated using the arithmetic functions. The result of the arithmetic operation can be used as an input channel, and can be displayed on the MultiCon screen or used to drive a controller output. The MultiCon controller can have a lot of parameters and functions to set up. This makes the device more versatile to help the user configure the MultiCon for any application, but this versatility can also make the setup process very time-consuming if only using the touchscreen to enter settings and select options. To speed up the process the Multicon has two USB Host ports which can be used to plug-in a PC mouse and keyboard to make it easier to browse menus and select configuration as part of the programming process. Although each CMC is supplied with a scriber, an operator can also use a PC mouse for easy configuration, especially if the user has many MultiCon units to configure at the same time. I ndustrial automation trends are going towards advanced controlling systems. The MultiCon has up to 5 separate PID controllers. The MultiCon can support very complex industrial PID control loop applications reducing costs and producing energy efficient control systems. The MultiCon CMC-99 can collect measurements from up to 12 temperature probes (18 temperature probes if using CMC-141) and send them to the SimCorder software which will log the temperature readings and store them in a data file for later analysis and transfer. One central instrumentation hub to view all temperature measurement channels in one place. The MultiCon is fitted with dedicated input slots along with type characteristics for either resistance (RTD) or thermocouple (TC) temperature sensors. These built-in input slots prevent the need to use additional devices like external transmitters to convert the signal from temperature probes. Many of the available controllers have built in relay contact switch outputs, but the MultiCon also provides the option for high current relay output modules. The MultiCon can be equipped with 4 or 6 relay modules rated to 5 amps current load. For example it is possible to control heaters with a 1200 watt load using the 5 amp rated relay switch. Furthermore MultiCon users do not have to install contactors or indirect relays in their applications to control high power load devices which leads to significant savings on space inside electric cabinets. On the occasions where contactors or indirect relay contact switches are necessary, the MultiCon is equipped with a 24 Vdc external power supply connection to drive the coils within these additional devices. A great deal of industrial automation solutions need fast switching outputs. The MultiCon has the option for solid-state relay switch outputs available with a choice of SSR output modules with different quantities of switching outputs. The switching of SSR outputs can be driven down to 0.1 sec time period. As an example a typical production line requires controllers with fast switching capability. The Advanced Communication Module (ACM) module is available as another slot in the CMC, this module provides a RS485 serial bus interface to connect to multiple RS485 equipped devices. The MultiCon Modbus RTU Master mode has many settings so it can customised for a wide range of networking applications. Intermediate pumping stations which are spread over a wide distance are a good example of what can be connected using the RS485 interface, and options like Modbus time-out are particular useful when using mobile phone communications to link together devices over greater distances. The Multicon Modbus master communication options may not be familiar to every engineer so the MultiCon has built-in preset configurations available for all other Simex devices equipped with RS-485 serial bus interface. To setup a RS485 connection it is as simple as choosing a device from the list in the MultiCon menu. There is no need to change any Modbus setting, and the communication will start and function automatically once another device is connected. There a many automation applications which rely on a date & time activated functionality. Utilising a PLC to carry out what is a relative simple control operation becomes very expensive, particular when the equipment is duplicated many times in a large production facility. The MultiCon has a timer system, which is fully usable with any process functions and using different input and output slots the control system integrator can design a very complicated automation system for less cost. As an example, the horticultural industry use controllers with date and time functions to manage water sprinkling at certain times of the day and for variable time periods. The MultiCon includes slot options for continuous analog control outputs which can be programmed to manage processes by varying pump speeds, valve positions, regulator settings, heater power and mixer speeds. Each controller output has a 12 bit resolution (4096 divisions) available, and using the profiles function the programmer can create very precise process control loops. For example in chemical and pharmaceutical applications a high resolution control is required for measuring the exact amount of chemical required to add to a particular production batch. It is possible to use the MultiCon as a network master to connect up other Simex instrumentation such as these digital I/O modules. Due to the smaller size of these modules, they fit very easily inside instrumentation control cabinets and panels. A single RS485 Modbus RTU interface is used to connect all the digital I/O modules to one MultiCon, where all the input and output values can be monitored and controlled. The MultiCon has the option for adapting the installation of the unit to a DIN rail holder. DIN rails are commonly used to mount electrical devices inside a control box cabinet. These control boxes provide a secure and weather protected enclosure for installing necessary electrical instrumentation that would otherwise not be adequately protect from wet weather and unauthorised access. A TS-35 DIN rail bracket is provided to fit to the rear side of the MultiCon and it can then be easily mounted onto a DIN rail already fitted to the inside of a control box cabinet. It is possible to view MultiCon display channels using your web browser such as Google Chrome, Internet Explorer, Microsoft Edge, Apple Safari or Opera from any location or type of computer device with a Windows, Mac OS, Linux, iOS or Android operating system. If your MultiCon has the Ethernet card option fitted then you can assign a static or dynamic IP address in DHCP mode which allows you to connect the MultiCon to your company computer network and view display channels remotely from any work station. In addition to the standard monitor and control functionality for the MultiCon, it is also possible to record data at the same time if the data logging function is activated using the software license key USB dongle. The recorded data can be moved to the free DAQ Manager PC software via a USB flash drive plug into the rear or front USB port. The DAQ Manager allows the user to analyse recorded measurements using tables or graphs. Data can also be exported as a file for use in other customer programs such as Excel for further analysis and generation of bespoke reports. Once the MultiCon has been set-up with logic channels and they have been grouped for for a particular display screen , it is possible to quickly access the control setpoints and make changes. To access a control setpoint you simply press on the required logic channel displayed on the screen and hold for at least one second. This saves having to go navigate through all the setting options in Menu mode. A great number of industrial applications are built using a wide range of proximity switches, which are mostly driven with fast digital inputs, like pulse counter inputs. These signals provide information about position, speed and flow. In order to assist with configuring the MultiCon controller & datalogger, a pdf version of the operating manual is stored within the CMC memory. The user can download the manual using a USB memory stick if it is not possible to download online or local network, ensuring all required documentation is always close at hand wherever the location. The MultiCon is available with a Modbus TCP/IP server version option. Up to 3 clients can communicate with the Multicon device at the same time, using either the MultiCon’s web page, DAQ Manager PC software or a dedicated SCADA software. Due to abundance of Ethernet port infrastructure within industry, Modbus TCP/IP is becoming a very popular method for communicating with industrial automation equipment. For very complex process control applications it is necessary to design a Human Machine Interface (HMI), which provides all the information and controls to manage the many parameters and stages of the process. Multipurpose SCADA systems can be a high cost solution, but the MultiCon provides a low cost SCADA device allowing you to build an HMI from web pages design using HTML code. There are plenty of applications that support html programming that are free to use as part of large scale open source projects. The HTML language allows system builders to design quite sophisticated user interfaces with detailed graphics and annotations. The HM2 and HM4 are the hour meters modules developed for the MultiCon CMC units. These modules allow the measurement of elapsed time between START and STOP signals, as well as sum of each period. These modules are an ideal solution to control operating time of machinery, to monitor duration of abnormal performance and for to determine maintenance intervals. The HM2 and HM4 have 2 and 4 independent counters respectively. Each counter is equipped with 2 inputs, START/STOP and a programmable one, which can be set to asynchronous RESET, HOLD or used as independent digital input. Time format is a method for changing the way a time is displayed. The user can easily select a desired format by entering a formatting string composed of letters and colons. For example this string w:d:hh:mm lets the user display the time as number of weeks, days, hours and minutes, separated by colons. The time format also allows a result to be divided into two or three independent channels. The input data must be expressed in seconds and the maximum display precision is 1/1000 of a second. The MultiCon has 1.5 GB of data storage memory enabling to save up to 125,000,000 records, and offers the possibility of remote access via ethernet interface. Thus, it can be successfully used as a recorder of climate data in remote locations. The mode of displaying values as phasor diagrams makes it possible to visualise the data collected from wind speed & direction sensors in the form of a wind rose diagram. As a universal controller and recorder, the MultiCon can accept signals from pulse or current output type flowmeters. In addition to the instantaneous flow rate value, the MultiCon will also calculate the total flow of liquid, gas or powder on a separate channel using the totalizer function. When controlling flow, the MultiCon has high load relay output modules and precise analogue outputs with a resolution of 4096 segments making it an ideal choice for demanding flow regulating processes. The multichannel MultiCon controller is equippped with a MultiLevel Access mode which makes it possible to allow limited setup access to more users. You can define up to 16 independent users including the administrator who is the only user with a permission to freely configure the device without any limitations. The administrator’s role also includes the facility to define permissions for other users. A file containing user permissions can be saved using external flash memory, and since it is portable, it can be used to decrease the configuration time when setting up additional MultiCon instruments. Only one user can be logged on at a given moment. The user is logged off after a predefined time period has elapsed from the last user interaction with the device. The elapsed time period can be set by the administrator as specified by the administrator and the user can logout at any time by clicking on the padlock icon in the information bar. Alternatively the authorisation process can be setup using USB keys. The hardware key allows the user to log on without the necessity of entering a password and removing the key is equivalent to logging out. A key is assigned to each individual user. This USB key access facility is only available on the MultiCon instruments which have the Access Dongle licence activated, otherwise the login and logoff process must be carried out manually. As an universal controller, the MultiCon is used in environments where the temperature is much higher or lower than the ambient room or outside temperature, such as in a closed control cabinet, in a production facility surrounded by heavy-duty machinery or within the control units of a seagoing vessel. To allow the MultiCon CMC to used in more places, it is possible to provide a version which is capable of operating at -20°C/-4°F . The MultiCon has a broad and varied range of available input/output modules making it an ideal control unit for small and medium-sized pumping stations. The controller input modules will accept output signals from flow meters and and hydrostatic pressure probes, and then by utilising the mathematical functions and PID control it is possible to apply complex control loops to manage the operation of the pumping station and protect the pumps against dry running conditions. For portable applications where it is not possible or practical to install inside a control panel or box, the MultiCon can mounted inside a PELI case which is highly robust for transporting and using instrumentation in field environments. The cases are made of highly impact resistant polypropylene copolymer, ABS and stainless steel and meet the most demanding safety standards. The input and output connections to the MultiCon are not compromised when fitted inside the PELI case since there are as many as 20 multi-pin connectors for sensors and external interfaces. In addition to the remote data insight via a web browser and the DAQ Manager software, the MultiCon can also enable direct process controlling from almost anywhere in the world. Using the Modbus TCP/IP protocol implemented in the MultiCon CMC as well as the remote display functionality, the user can easily transfer the display of the device onto their computer screen. Connecting the MultiCon to a router with properly routed ports enables full control of the remote display application from anywhere. Due to the many temperature sensing devices that can be connected to the MultiCon I/O modules it possible to utilise it as a temperature process controller for heating applications. The MultiCon provides interfaces for both thermocouples and RTD temperature probes. The relay outputs, fast acting SSR outputs and analogue outputs can all be assigned and configured to trigger using simple algorithms of threshold control or more complex PID control algorithms. The very user friendly and intuitive human interface allows you to create a heating profile tailored to your heating process application requirements. Using an Ethernet connection and the “Remote Display” feature, a user can request remote support to resolve any issues with configuring the MultiCon from any geographic location. All you need to do is to connect the MultiCon to a router with properly routed ports. A technical support engineer will be able to assist in configuring the device. Furthermore, every user has the ability to save any configuration which they may send to a technical support engineer for troubleshooting. If the MultiCon is equipped with flowmeter inputs and relay outputs it can be turned into a smart dispenser. Using the totaliser function it is possible to measure the amount dispensed and when to shut off the dispensing pump valve. In especially slow varying processes it can be difficult to detect changes in process conditions when only looking at the measured readings. The MultiCon provides the option to display process data as a trend diagram so that the process performance can be compressed over time to display the change over a set period of time. Up to 1 weeks worth of data can be stored for displaying in the trend diaphragm. When designing a production assembly machine or or a testing machine, you can incorporate the MultiCon to monitor and control the whole process from start to finish. The MultiCon offers complete flexibility and customisation to adapt it to an input/output task. The instrument includes lots of different I/O modules to interface with any type of sensor, and a 1.5 GB memory for simultaneous recording of 60 measuring channels. 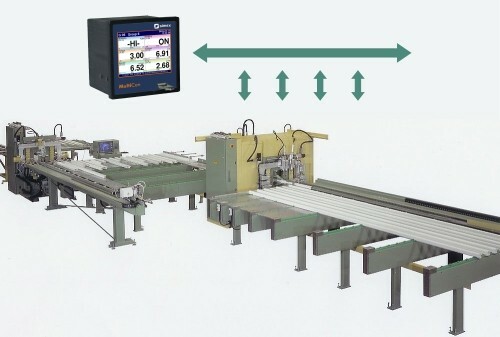 Apart from measuring the non-electrical parameters which are key for production, such as temperature, pressure and flow, the MultiCon will enable the production engineer to calculate cycle details, record the machine operation time and assign control signals based on measured inputs or mathematical functions which collect input signals from multiple sources. If the ACM (Advanced Communication Module) module is installed then you will have three isolated RS-485 interfaces to allow you to connect other MultiCon devices together on larger process systems. This is useful for when you need more than one display unit on a large system, and need to communicate data or send commands to a master or slave device elsewhere on the system. The fully connected units may share operations such as the local display of measured values and controlling the physical outputs at the other end of the system. By combining the multichannel and signal type capability of the MultiCon, it is possible to handle almost any type of signal from a mixed group of sensors. Each signal can be configured to display over the appropriate measurement range and all grouped together on one display screen. It is possible to set-up 90 separate channels with the MultiCon and indicating all of these channels on one display can be very challenging. To help manage the display of multiple channels and display screens, the MultiCon provides an automatic change of view feature which allows the user to configure how, where and when every channel is displayed. In the set-up for this feature you can change timeout, source of change activation and time to display before moving on to the next channels to display. It is also possible to present the readings and data in different ways such as with numeric values, line charts, phasor diagrams, vertical or horizontal bargraphs, and an analogue meter mode. Apart from the basic arithmetic and trigonometric functions (sum, product, sine or involution) and logical functions, the MultiCon also includes advanced functions such as derivative and integration. An example of applying an integral is for MultiCons which only have standard current measurement inputrather than a pulse/counter totaliser input module, and need to display the quantity of product that has passed based on the flow rate. Calculating power and acceleration, as well as balancing and averaging of measurement data is much more convenient using the derivature function. Implementing the advanced mathematical functions such as derivative, integral, count pulses, flip flop and average, extends the type of calculations possible with the MultiCon. Also you can more easily implement complex application calculations by eliminating the need for extra channels that you would otherwise need to create to achieve the same calculation. It is possible to measure all the parameters required simultaneously for managing the contents of a storage tank with the MultiCon such as temperature, pressure, liquid level and flow in/out. The instrument is equipped with flow measuring modules which enable the operator to precisely determine the real time flow rate, dosage amounts to tanks, and calculate the total amount of product transferred over time. Global access to the device is possible through the Ethernet interface which also makes it easier to download saved data form the onboard memory. There is 1.5 GB of internal storage in the MultiCon which enables you to store up to 125,000,000 readings. In some applications it is necessary to improve the performance of a process by tightening up the accuracy of the measurement inputs from various sensors critical to the process output. The multicon includes the ability to enter up to 19 straight line sections within a measurement range. This allows the process engineer for example, to remove an unwanted sensor characteristic or modify the sensor output to incorporate a basic correction for the change in shape of a tank. The relay options available for the MultiCon controller are numerous and are highly configurable. The relays can work in 5 different modes including Pulse Width Modulated (PWM) for SSR relay outputs. Each realy has a seaprate setting for trigger source, thresholds and hysteresis, and the user can also define the delays for the switching time, the minimum switching time. Laboratories are highly sensitive to changes in environmental conditions. If the environmental conditions are not optimal it can be detrimental to production quality, employee safety and experimental test results. Many processes and working conditions are impacted by extreme changes in temperature, humidity and pressure. The MultiCon is capable of measuring any environment sensor and grouping the readings together to display on the screen or to be used in an environmental calculation. The lab environmental data can also be saved for quality assurance records, audits and reports. If environmental conditions exceed acceptable limits then you can configure alarms or transmit signals to other devices to restore nominal conditions, or even set-up control loops to maintain continuous control of the climate within the laboratory. It is possible to set-up up to 32 different email messages activated by a pre-configured trigger, which send channel status data to any email address. Critical events can be easily defined and an alert sent via email to any number of email addresses. The email message consists of three elements: subject, message text and a data attachment. The attachment contains values from the selected groups or individual measurement channels which is contained within a .csv file. The MultiCon supports secure email account access encrypted with TLS or SSL protocol. You can configure the MultiCon to send emails from the address you assign by adding the appropriate SMTP outgoing email server, SMTP port, account login & password. The email notifications system functionality requires a license key which is supplied as optional extra in the form of a USB dongle to activate the feature. The derivatives maths function can be used for to detect changes in a measured heating process. Using derivatives you can configure control operation which trigger when the temperature stops increasing or decreasing. Once a predefined derivative threshold value has been exceeded a device can be activated to change the heating profile, or simply to register the time of the event. The operator can also program any level of change in rise/fall rate which will to trigger a response from the controller. There are numerous ways in which a user can remotely access their MultiCon device. One of them is the ability to use the screen of your PC as a controller display. After configuring an admin password, the built-in webpage displays a hyperlink allowing you to redirect the MultiCon screen to the Xming application which you will need to install on your PC. MultiCon devices are often used in applications where something needs to be activated at a precise time. In addtion to manually seeting the time & date, it is also possible to synchronise the the date & time automatically using an internet service. After installing the most up-to-date firmware and connecting the device to the internet, you can enter an NTP (Network Time Protocol) server address. From then on, the device will automatically synchronize the time with the selected server and make adjustments for daylight saving time where applicable. One of the most popular MultiCon features is the data recording functionality. You can define which channel is logged and how often. In addition you can also set-up conditional data recording, where you can allocate a channel to be a trigger for starting to record a group of channels. Using conditional data recording, you can record particular parameters only during critical conditions, for example when a certain value exceeds a defined threshold. Another example of the application of conditional data recording used along with along with a time profile, is cyclic data recording, where you can record just the first minute of each hour. A typical application for the MultiCon is to be used for the management of an annealing process. In annealing processes, the key is the rate of temperature increase/decrease, as well as the time the elements spend in target temperature-established state. However, there are annealing processes where the number of cycles is more critical than the time spent at a target temperature. The MultiCon can handle this type of task as well allowing the process engineer to set the number of cycles of your choice for a particular process, as well as the threshold value that will initiate the cycle count. After the specified number of cycles is reached, the device will inform the user via one of the communication channels (e.g. e-mail). Using the counter input (CP2/CP4) and the encoder connected with the measurement system of the production line, you can precisely define the measure of material used in the manufacture of a product. Scalability allows you to view not only the length, but also the material weight (e.g. wire, steel, foil) directly with the MultiCon. You can set up scalability manually or it can be adjusted automatically. The logical channels for a MultiCon devices can be configured in various forms, and one of them is as a hardware output monitor. Depending on the type of output, the device can display the signal in a binary (in 0/1 bit or descriptive form e.g. START, STOP etc…) or analogue (4…20 mA scaled against engineering units) form. This functionality allows you to use the gathered data to create logical control structures or to run system diagnostics. You do not need any external controls or meters to visualize output status if using a Multicon. The MultiPrint is an optional accessory thermal printer designed for direct use with the MultiCon controller & datalogger without the need to connect a PC inbetween. The print-out consists of three basic parts: The header, the content and the footer. The header and the footer are composed of .png image files, which the engineer can prepare in advance and upload to the MultiCon to create a template report. You can create up to 8 independent report templates. You can then setup a trigger for the MultiCon to commence printing and define logical channels and channel groups to be included on the print-out. The content of the print-out is added at the time of printing, and consists of a table with the preselected measurement results. The print-out can also include the date and time of printing, which is entered above the table. The trigger for printing can be the time a particular event takes place, or at a time interval, e.g. every hour, and it can also be started manually by the operator. For strength tests a data recorder has to be capable of sampling at a fast enough rate to capture the changes in the tested parameters. Fatigue tests involve a repeated application of the same load on the unit under test, which requires long-term recording. The MultiCon satisfies both of these requirements with 1.5GB of integrated memory and the option for changing the length of a sampling period to 0.1 seconds. If the counter inputs are included then you can receive signals from proximity sensors to monitor pushbutton tests or other applications where you are testing the number of on/off or open/close operations. If a pressure transmitter is measured by a MultiCon via the analog input slot you can incorporate the two into a pressure testing rig. In addition to binary relay output modules and fast SSR outputs, MultiCon has also been provided with current outputs. These outputs are used for proportional control of servo valve assemblies. Actuators positioned by such valves can operate synchronously, but since the individual analog outputs can be interdependent, groups of such outputs can be used to control more complex positioning systems. In addition to static installations the MultiCon is also suitable for use on vehicles for recording critical parameters during transit. For some products it is necessary to demonstrate a product has not been exposed to certain environmental conditions that may have impacted on the quality of the product. If necessary, the device can be placed in a durable P130 case and the MultiPrint printer can print out an easy-to-read report documenting measurement data for the entire journey. Every MultiCon instrument has at least one USB port at the front or rear of the case, depending on the configuration. This is the simplest method of connecting a flash drive or memory stick for the exchange of data with the internal memory. An ordinary flash drive is sufficient to transfer the entire configuration from one device to another device without the need to re-enter the configuration, duplicating the work. It can also be used to load the Modbus template of the device to which the MultiCon will be connected, and also copy the recorded data. The simplest form of product sorting consists of an analysis of a single feature of the product. If it is necessary to analyze multiple parameters, the process can be conducted in several simple steps or in a single comprehensive step, but, in such cases, simple logical conditions are no longer sufficient. It is necessary to collect all information about the product and then, using combinations of logical conditions, accordingly control the outputs, which can easily be done by the MultiCon controller equipped with mathematical logic functions. The arguments of those functions can be binary or numerical values, and the large number of logic channels enable the creation of comprehensive combinations of conditions with outputs that affect the behavior of line actuators. The large number of functions that comes included with the MultiCon makes it suitable for simultaneous recording and control which makes it a useful device for managing chemical metal treatment processes. The process engineers in such applications would then be capable of observing all relevant parameters, e.g., the concentration of the individual elements in the bath, pH or temperature, and also to control the parameters that are essential to the given process, e.g., electrical current intensity, etc. In long cycles, the function of conditional recording can also useful in enabling data recording in emergencies or modification of key parameters to ensure transparency of data. The ability to remotely access the MultiCon screen allows personnel to monitor & control the metal treatment process without having to enter an area which has limited access due to health & safety reasons. In the CMC-99 setup, can we setup two output relays to read from the same input signal but triggered at different setup ranges? Each relay can be setup from any input signal if you create a maths channel which does an ‘and’ / ‘or’ type calculation of the input channels. Is it possible to record 2 separate files at once with the system? Where we have 2 test bays, we may sometimes perform 2 separate tests at once. If we could assign certain sensors to test bays prior to the test that would make things useful for us. Yes, this can be done by assigning the sensors to different groups and data logging the groups at the same time. Can I download the logged data via an ethernet connection instead of using the RS485 to USB cable? Yes, if you choose the ACM communications module option, you be able to connect to a computer via the RJ45 ethernet connection and then you can download logged data using the included the DAQ Manager software. What is the minimum sample rate of data recording with the MultiCon? The minimum reading update rate that can be set for storing data is 100 msec or 10 hz. Is there an analog signal input for 4-20mA in the MultiCon data-logger? Yes there are 3 available input slots and there is a choice of input card for each slot. If necessary you can fit a 16 channel 4-20mA input card in each slot providing a total of 48 independent pressure channels. Can the MultiCon log a pressure sensor for Datalogging? Yes with the datalogging option the signal from the pressure sensor can be connected to the one of the analogue input channels on the rear of the instrument. The input signal can then be configured to display the pressure reading on the MultiCon display as a numerical value, graph plot over time or dial gauge indicator. The data can also be saved as a file and transferred to flash memory via the USB, ethernet or other serial interface. I have a requirement for six pressure gauges, four are for pressure and two are for temperature. The gauges will be used on a compressor test rig. To reduce the noise levels we are building a cell around the test area to deaden the sound when the compressor is running. The control box will be outside on the test cell. Is there a gauge which will provide a remote interface so that the display can be mounted and read outside the test cell? The approach we would suggest is to use 4 remote pressure sensors and 2 temperature sensors and feed each signal wire into a MultiCon multichannel indicator. This low or high voltage powered indicator can be mounted into a panel on the control box. The MultiCon has a 320 x 240 pixel display which can be custom configured to show 6 virtual dial gauges, all indicating the reading level of each sensor at the same time. I am searching for a digital indicator which can do the maths between 2 channels to create a differential pressure (DP) reading, what do you suggest? The MultiCon is a multi-sensor input digital readout which includes as standard the ability to create measurement display channels by applying a maths function to specific sensor inputs. This can be configured via the front panel set-up menu screen as shown in the image below. I run an environmental test lab and I need to simulate altitude over the barometric range of 500 to 1030 hPa in a number of environmental chambers that are located in the lab. I would like to monitor the pressure in each vessel and feed the pressure readings into a central logger where we can display real time baro changes and store results for later analysis on a computer. Please suggest a possible instrument that would fit my requirements. We would suggest the DMP331 which can be scaled to 500 to 1,030 mbar absolute, and the MultiCon which has multiple channels that can be configured to display the trends of multiple channel inputs, store the data for upload and provide a real time stream of data via ethernet, RS485 or RS232. What is the Ethernet connection used for that comes with the Advanced Communications Module (ACM) on the MultiCon controller and datalogger? The Ethernet connection allows you to connect the MultiCon to a network and access it from any PC that is connected to that network. You can upload logged data that is stored inside the MultiCon via the DAQ manager software. You can also obtain readings in real-time in a basic format via a web browser such as Internet Explorer, Firefox or Google Chrome by typing the IP address allocated to the MultiCon on the network. In the future it will also be possible for users to create their own webpages via an applet to display real-time data. Can the setup of the MultiCon controller be configured via the DAQ Manager software or is it only possible via the front panel access? Configuration is carried out via the front panel, however you can plug a keyboard and mouse into the USB device ports and front usb slot which makes it easier to navigate the configuration menus. Can you display tables and charts of logged data on the touchscreen of the MultiCon datalogging controller or is it only possible on a PC? The display can be configured to show a chart view which rolls at 12 minute cycles which provides some historic data, but the PC interface and logging software is the intended way to view and analyse the logged data. Is the MultiCon controller ready for datalogging as standard or is there an activation option? You will need to select the license key option when ordering the instrument to activate the data logging function. Once activated you can data log any group of input channels from a minimum interval of 0.1 second up to 3600 hours as a sample rate. Can you tell me what I need to be able to operate up to 40,000 psi? We would suggest the DMP304 which is a high range pressure sensor which would cover measuring up to 40,000 psi, combined with the MultiCon. Will the MultiCon accept 2 inputs of 0-10v dc or 4-20mA to display temperature and %RH? The application is for installation in a clean room environment and would need to be IP65 rated. The display will be mounted on a stainless steel enclosure. Yes the MultiCon is fully configurable and can accept multiple inputs from either 0 to 10Vdc or 4 to 20mA which can be converted into temperature or relative humidity engineering units. Both input channels can be displayed on the display simultaneously. There is also the option for increasing the front panel protection to IP65. We are looking for a panel mount multi-channel indicator for 6 analog input (4-20mA), would the MultiCon be suitable? Yes, you can select one input card for the MultiCon which has 8 volt and 8 current inputs to handle 6 individual 4-20mA input at the same time. You can also display all 6 input readings simultaneously on the display screen. Please select the options you require for the MultiCon Multichannel Controller and Datalogger in your application and request a quote. Send us your enquiry for MultiCon Multichannel Controller and Datalogger to get assistance with this product type.